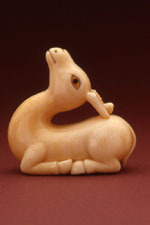 Mr. Robert O. Kinsey presents exquisite example of netsuke by contemporary carvers from Japan and around the world. He discusses in depth the memorial netsuke created in honor of His Imperial Highness Prince Norihito Takamado exhibited at the Honolulu Academy of Arts. He devotes a special tribute to four important netsuke artists who have recently deceased, Armin Muller, Masatoshi Nakamura, Seiho Azuma, and Guy Shaw. His new book, The Poetry of Netsuke, and The Raymond and Frances Bushell Collection of Netsuke-A legacy at the Los Angels County Museum of art are introduced during his lecture.